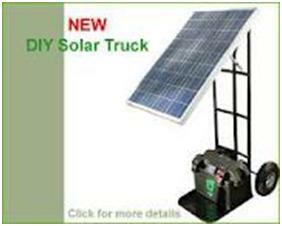 This idea of DIY solar truck has been taken after theft of solar panels of many users and needed to take their solar panels and required to take the panels and batteries indoors at night. The solar truck is a portable standalone solar powered station for powering any electrical device, from mobile phones to televisions, laptops, lighting, tools etc. The 55 watt solar panel collects sunlight and converts it into electrical energy which is stored in its internal battery. The stored power can then be used at its native voltage of 12 volts (the most efficient method) or stepped up to 110 / 240 volts for mains powered devices (Slightly less efficient typically 90% dependent on the load attached. This is dependent on the strength of the sun light and duration of time the solar panel is exposed. The solar panel is rated at 55w/p or watts peak; therefore in full sunshine the panel will be charging the battery with 55 watts of power or 4.5 Amps of current. To illustrate 55 watts, this is enough power to run a laptop computer, a small television or 8 energy saving light bulbs in full sunshine with no battery connected. The benefit of having the battery is that the day’s solar panel power can be cumulatively stored and much higher power devices can be powered, e.g. a kettle or small heater etc. The batteries storage capacity is 110 A/h or Amp hours, therefore to charge a battery fully from the 55w solar panel @ 4.5 Amps. The full battery could then run e.g. a laptop for this amount of time (24 hours) or a 1Kw heater for 1 hour, in reality you would never discharge a lead acid battery fully, and 50% max for battery longevity. The very nature of the design being portable, allows the trolley to be manually pitched towards the sun throughout the day (track) as the sun moves from east to west. 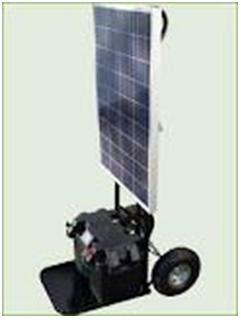 This tracking ability increases the power yield by up to 30% over static mounted solar panels. In its first prototype, a gas assisting lifting strut was fitted for very easy rising of the solar panel, this worked well until a colleague trapped his fingers in the top hinge, ouch, and I decided to go with a more simple ‘notched’ steel stay with a wing nut to tighten the panel in place.